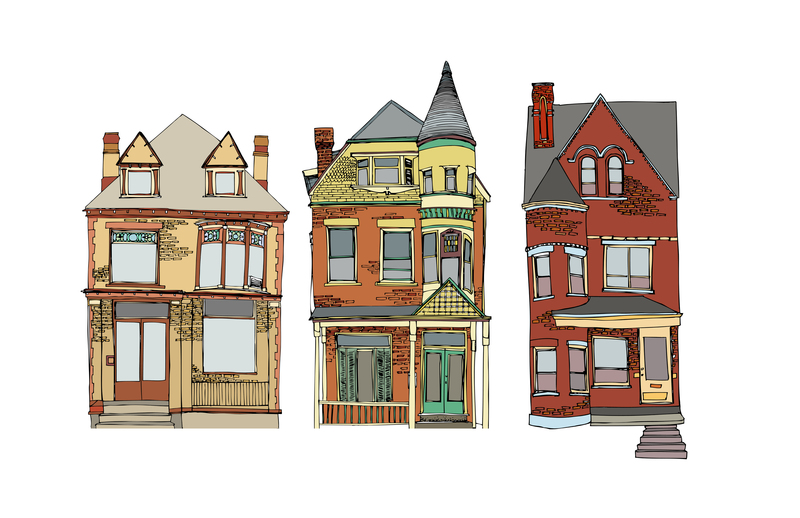 When Abbie Miller set out to draw every house on Euclid Avenue, she knew that the street spanning Highland Park and East Liberty would include a lot of architectural diversity. She did not realize just how much her drawings would capture a piece of the evolving neighborhood history. 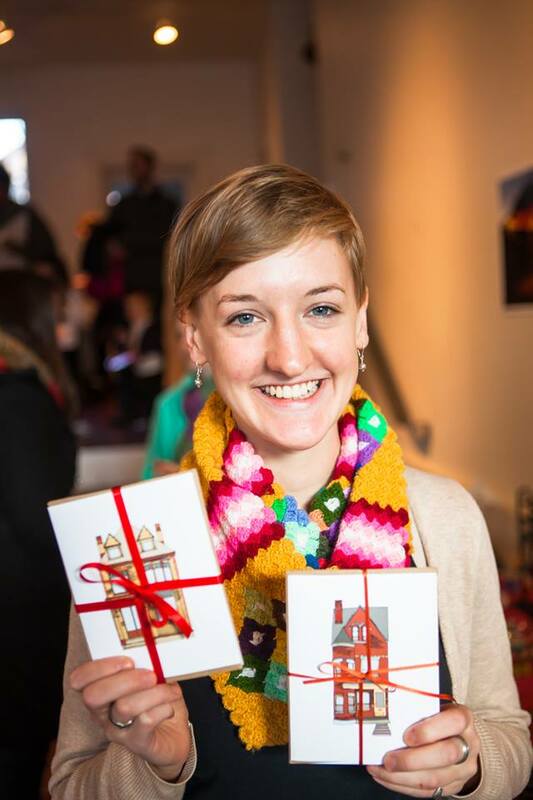 Abbie created Project PGH: The Euclid Avenue Project when she moved to the city last fall. After completing her art degree at Goshen College in Indiana, she was excited to move into a large, old Highland Park house with stained glass windows and intricate ceiling molding as a PULSE Fellow (Pittsburgh Urban Leadership Service Experience). 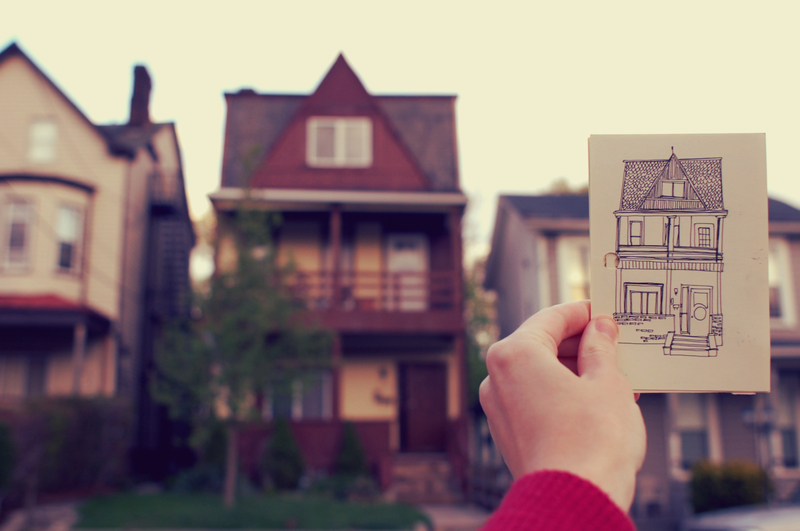 This was the first Pittsburgh house she drew. Abbie has started viewing her project as a street snapshot during the neighborhood’s transitions. In April of this year, parts of Penn Circle were renamed ‘Euclid Avenue’ in an attempt to restore the street’s original names before they were changed during Urban Renewal in the 1960’s. This extends Euclid Avenue several blocks into East Liberty’s commercial district. Faced with a shift in her project, Abbie decided to also draw the houses and buildings on the extra blocks, which include McDonald’s and a large abandoned police bureau. Abbie notes that as she moves along Euclid Avenue, the number of abandoned houses and the sidewalk quality change. “You can walk a block and feel like you’re in a different place,” Abbie says of Pittsburgh neighborhoods. However, her Euclid Avenue drawings focus on the house structures. Her line drawings don’t show what state the house is in, she says, so they create an equalizing depiction of each house. Abbie is inviting everyone who lives on Euclid Avenue to her project’s gallery showing as part of Penn Avenue’s Unblurred Gallery Crawl on this Friday, June 6 at 5151 Penn Avenue. There is a reception for Euclid Avenue residents at 6:00 pm, and the gallery is open to the public 7:00-9:00 pm. “I’m a very big advocate that everyone should have access to art,” Abbie says. As someone who has spent a lot of time in art galleries, she finds it important to consider the people who aren’t visiting art galleries and how to make art accessible to these broader communities. Abbie hopes that the idea of finding their house on the wall will attract people who might not typically come to a gallery. She plans to give house portraits to all Euclid Avenue residents who attend the show.